You can customize the extent of your ArcScene document by interactively defining an area of interest (AOI) in the scene. Use this tool to reduce the 2D extent of the view to improve ArcScene's efficiency when working with large datasets, or simply highlight an area you want to focus your analysis and visualization tasks within. The tool does not allow you to specify a vertical (z) range for the area of interest. The AOI tool is located on the Tools toolbar and is unique to ArcScene. 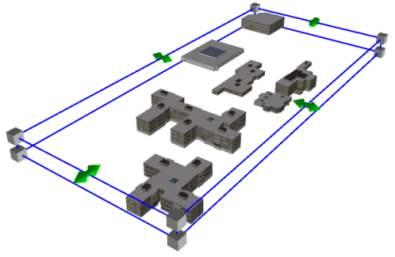 The tool is highly interactive so that you can constantly resize and relocate the bounding box around the scene. The AOI tool works by only displaying features and surfaces that are wholly, or partially, within the bounding box. No data will be clipped. For example, if a road feature is partially within the AOI box then the entire feature will be shown. 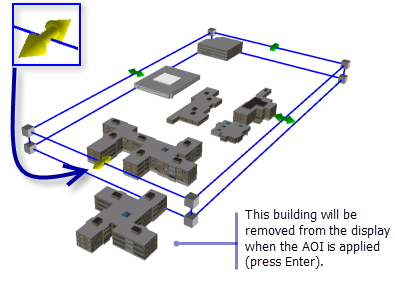 To use the AOI tool, follow the steps below. You will need to have added some data visible within the view, for content. Click the AOI tool on the Tools toolbar. A blue box will appear, showing the current area-of-interest extent. The first time the tool is enabled this will be the full extent of your scene. Click and drag the corners of the AOI box to resize it proportionally. Click and drag the green arrows to reshape the box. Only that side of the box moves. Click and drag from the center of the AOI box to reposition it. The box will turn yellow indicating it is ready to be moved. Press ENTER to set the area of interest in place. Any features fully outside the AOI will no longer be displayed. Press ESC to return to the AOI to the full extent of the scene. When you have set the extent area you want to work in, click on another tool to turn off the AOI box and continue your tasks. Click the AOI button again when you want to reset the extent. This is the Area Of Interest box at full extent. Using the control arrows, you can resize the shape of the box from one side. If you use a corner, it will resize proportionally. The arrow or corner you resize from changes color when its active. You can relocate the entire AOI box from its center. You can press ALT any time to navigate the scene without switching tools. This way you can adjust the view while you customize the AOI box before applying it.